All plans and information shown here for a 4000-seat stadium were taken from Home Field Advantage’s website, social media, and fundraising initiatives in 2016. No plans were presented or provided to the general public by any other means. The details remained unspecified but fundraising goals confirmed a 4000-seat stadium capacity at the time of this proposal. Please note that almost all renderings provided were aerial views. 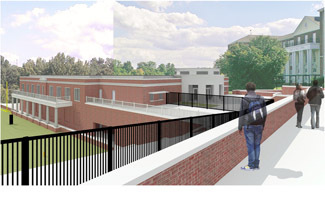 The following R.J. Reynolds stadium and Wiley Middle School renderings were prepared for Home Field Advantage (HFA) working in coordination with WSFCS. Stadium rendering 6, the only pedestrian view provided, is an inadequate illustration of the impact of a stadium upon park vistas. A row of mature trees can obscure walls and the back of bleachers in an illustration. In actuality, a large football stadium looming 12-25 ft. above a playing field cannot go unnoticed behind a hedge. 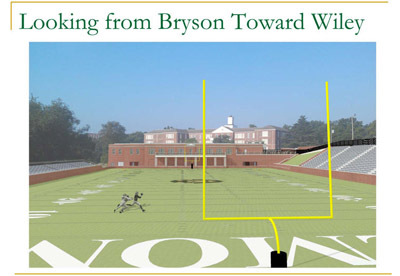 R. J. Reynolds high school stadium Rendering 6 from Home Field Advantage’s website showing views from Hanes Park towards the relocated and reconstructed Wiley gymnasium and stadium retaining walls and bleachers. R. J. Reynolds stadium rendering 1 from Home Field Advantage’s website showing views from the football field towards the home stands of a 4000-seat stadium, Wiley School and Gymnasium. Wiley Middle School, Wiley Gymnasium, field retaining walls and the visiting bleachers as viewed from Hanes Park. A sectional drawing of the stadium plan as presented in 2012 indicating changes in elevation from Hanes Park to the field and bus parking lot.